← Why Assess the ANS? Excessive alcohol consumption is not uncommon among high school, collegiate and professional athletes. This typically occurs after competitions during the season and likely with greater frequency throughout the offseason. Today I’d like to share what I’ve learned after reading through the available research pertaining to alcohol and HRV in healthy individuals. 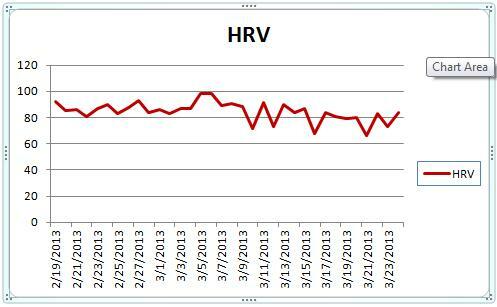 In addition I will post up some ithlete data I’ve collected showing the effects that excessive drinking has on HRV. Bau and colleagues (2011) investigated the effects of 60g of ethanol ingestion on HRV in young men. HRV was measured before and during the following 17 hours after ingestion. Compared to the control group, the ethanol group saw a decrease in all time domain indices of HRV that persisted for 10 hours. Koskinen et al (1994) tested the effects of ethanol consumption (1g/kg) on HRV in healthy young males (n=12). HRV was measured prior to ethanol ingestion and once each hour for 3 hours after ingestion. A significant decrease in RMSSD and HF was observed compared to control. In healthy volunteers Weise et al. (1986) observed an immediate reduction in HRV after alcohol consumption (0.7 g/kg) with no change in HR or blood pressure. Spaak et al. (2009) investigated the dose-related effects that red wine, ethanol and water have on HRV in a mixed group of healthy folks (n=12). Essentially, one drink of either red wine or ethanol had no effect. However, after the second drink HR increased and HRV decreased (Total HRV by 28-33%, HF by 32-45%, LF increased 28-34%). The last study I’ll discuss is perhaps the most relevant. Sagawa et al. (2011) monitored HRV and sleep quality (polysomnography) after alcohol consumption in university aged healthy males (n=10). There was a control group, a low dose (LD) group (0.5g/kg) and a high dose (HD) group (1g/kg). As you can imagine, there was a dose related effect of alcohol on HRV and sleep. The HD group saw the lowest HRV value, highest RHR and poorest sleep quality. The LD group also saw reduced HRV, increased RHR and reduced sleep quality compared to control. Below is a screen shot of mine from over the Christmas holidays. 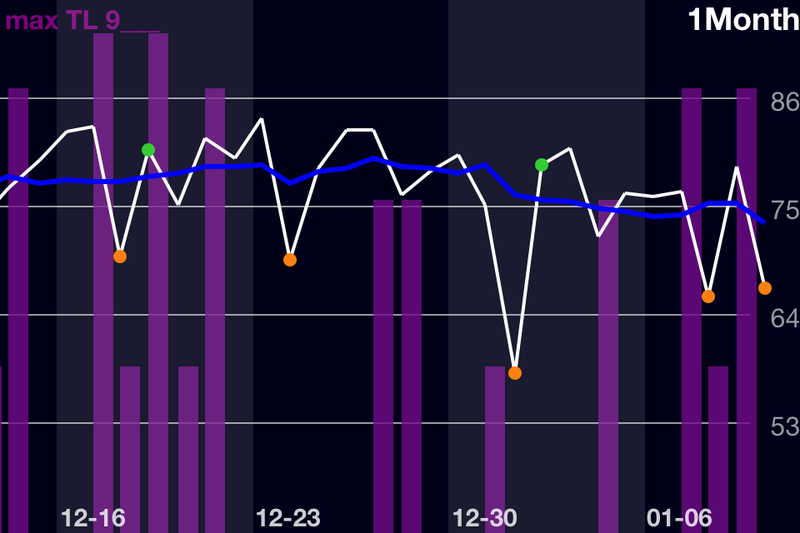 There is a marked drop in HRV on New Year’s day following a late night of NYE celebration that included several drinks. The data set below is a re-creation in excel from an athlete/colleague who doesn’t know how to take a screen shot with his phone (c’mon man!). The three lowest dips on the trend all occur in March after nights out drinking on the 10th, 16th and 23rd. The dip from the 12th is reported to be caused by other stressors. For those who didn’t already know, alcohol has a negative effect on HRV and sleep quality in healthy individuals. Clearly this can impact recovery and performance and therefore should be avoided, or limited to time periods away from competition and/or rigorous training schedules. Bau. P.F.D. et al. (2011) Acute ingestion of alcohol and cardiac autonomic modulation in healthy volunteers. Alcohol, 45: 123-9. Koskinen, P. et al. (1994) Acute alcohol intake decreases short-term heart rate variability in healthy subjects. Clinical Science, 87(2): 225-30. Spaak, J. et al. (2009) Dose-related effects of red wine and alcohol on heart rate variability. American Journal of Physiology, Heart & Circulatory Physiology, 298(6): H2226-31. Weise, F. et al. (1986) acute alcohol ingestion reduces heart rate variability. Drug & Alcohol Dependence, 17(1): 89-91. This entry was posted in Heart Rate Variability and tagged alcohol, heart rate variability, HRV, sleep. Bookmark the permalink. Thanks, I’d be happy to keep in touch. Let me know when your app is complete. I’ll check it out. Thanks for stopping by. Try your experiment on people with CFS! My average HRV is around 43 (34-58), and per one CFS study it takes 49-61 hours to recover from 1 hour of exercise (normal people took 4.5 hrs for blood markers to return to normal). Endorphins are also 1/5th normal in those with CFS, so exercise makes us hurt and feel like crap. Needless to say, we typically dont exercise much, or do much of anything besides stretch and read. I used to be a national level Masters (age 50+) powerlifter, when the CFS was more mild. After 7 beers on the 4th of July, 3 days later my morning HRV essentially doubled to 80. I took 3 other readings over the day, and they were 85, 80, 83, so it was not an anomaly. A month later (I dont drink often), I drank a bottle of red wine, and my HRV went to 78 two days later. Alcohol is the first thing I have found that effects my HRV, albiet delayed 2-3 days. Otherwise it is mostly always in the 40’s and 50’s. I was wondering if other CFS sufferers (=people with low ATP systemwide from smoldering viral inflammation for years) react backwards HRV-wise from alcohol, too?